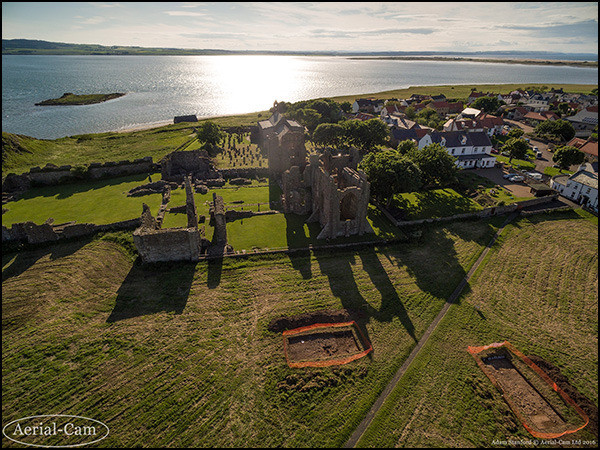 Holy Island is of great significance to the history and archaeology of early medieval Europe. An important monastic foundation, it had close connections with St Columba’s great monastery of Iona in Western Scotland. Following the death of its abbot, Cuthbert, the monastery became an important cult centre and his relics were translated in AD698, an event which may have been the stimulus for the production of the Lindisfarne Gospels. It was one of the first monasteries in Britain to be subject to Viking raids in the late 8th century. The increasing regularity of these raids culminated in the community leaving the island and after a series of interim resting places, finally re-establishing itself in Durham cathedral. A campaign of investigation on the island took place in the 1980s, but despite the importance of the monastery, there has been relatively little recent archaeological research. Whilst, the earlier investigations revealed important information about early medieval activity elsewhere on the island (particularly the agricultural settlement at Green Shiel), it was less forthcoming about the topography of the early monastery. To this end, a major 20ha geophysical survey funded by National Geographic was carried out by Durham University in September 2012. This has shown that there is limited archaeological evidence for the monastic boundary that had previously been postulated, but an alternative boundary has been identified, which is associated with an area of possible industrial activity. It also identified a probably infirmary cloister associated with the later priory and a possible structure aligned on the two standing churches. In the summer of 2016, Dr David Petts (Durham University) in collaboration with DigVentures carried out a two week excavation to evaluate and groundtruth the results of the geophysical survey. This involved opening up three trenches- one on the western side of the village in Glebe Field and two in Sanctuary Close to the east of the ruins of the later medieval priory. In our trenches in Sanctuary Close, we believe we have found evidence for the early monastery. In one trench, we identified a large bank of rubble. On inspection this turned out to have lots of disarticulated human bone embedded within it. Whilst we started dismantling this feature we found two fragments of Anglo-Saxon carving. Both were probably simple burial markers, and one was a fine, if fragmentary, example of the small group of namestones that have been found before on Lindisfarne. This combination of human bone and grave markers suggests we must be close to an Anglo-Saxon cemetery, although it has clearly been badly damaged. As we removed this rubble deposit, we started to find a number of stone settings, possibly gullies, that seem to hint at some buildings in the immediate vicinity. In our other trench in this field, we found an area of flagstone paving and yet more rubble spreads. From this area we found several pieces of metal slag, perhaps indicating metal working nearby. Most importantly, we also found a silver coin of King Eadberht (AD737-58); this is very similar to a coin found during excavations under the English Heritage visitor centre that took place in the 1970s. In our field to the west of the village we found evidence for a substantial medieval (12th-15th century AD) occupation. A series of walls and floors were uncovered, and we found a number of big rubbish pits, which were crammed with seashells, presumably the debris from baiting long-lines for fishing. We found lots of other evidence for island life in this area, including iron fish-hooks, a fragment of sawn whalebone, many fish bones and distinctive iron nails from wooden boats. Although we did not find direct evidence for earlier Anglo-Saxon activity in this area, we did find a piece of a bone comb dating to the late first millennium AD. Petts, D. (2013). Expanding the archaeology of Holy Island (Lindisfarne). Medieval Archaeology 57: 302-307.